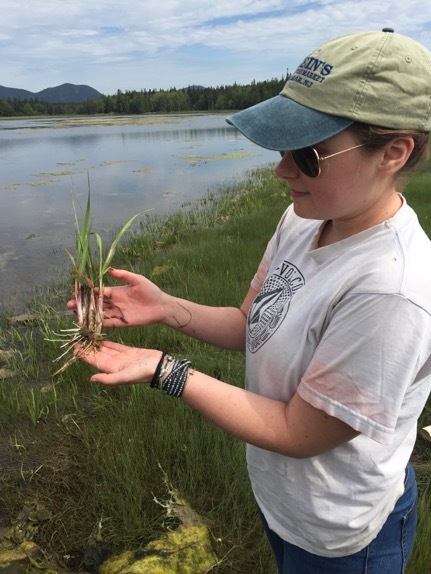 As Caitlin mentioned in the last post, the Primack lab (Amanda, Caitlin, Richard, Abe Miller-Rushing, and I) got together in early June to set up a salt marsh experiment in Acadia National Park in Maine. The study will test the effect of sea-level rise on growth and reproduction of salt marsh cord grass in low and mid tidal marsh vegetation. We chose two beautiful sites in the park, one in Bass Harbor and one on Thompson Island. 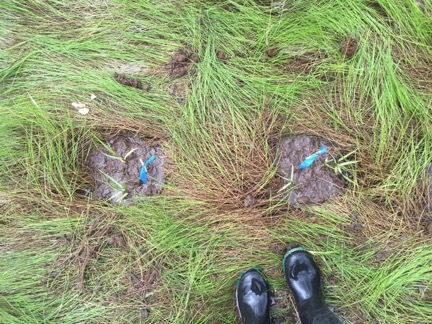 We reciprocally transplanted individual plants of the two cord grass species between the low and mid marsh, exposing the mid marsh plants to a higher inundation intended to imitate sea-level rise. Low marsh plants transplanted to the mid marsh will experience a lower inundation comparable to a sea-level fall. We will monitor growth and reproduction in all of our transplants as well as control plots throughout the growing season. Thanks to everyone for their help with the set up for this study! It involved some hard work and we had a lot of fun. Greetings from the northern contingent of the Primack Lab! 2016 has been a wonderful field season in Acadia National Park. To start, there were no six-foot-tall snow drifts covering the experimental gardens well into May. Our all-star undergraduate research assistant from 2015 returned for a second season on the project before graduating from College of the Atlantic earlier this month. And best of all, no maternity field pants (just leftover maternity sweatpants waiting at home at the end of a long field day). The 2015 field season had its high moments, but I think that after the challenge of pregnant field work last year, it's easy to see this year as all smooth sailing! The youngest phenology researcher in our lab has been busy collecting data from her perch in the baby backpack. When she is not tagging along on observational transects, baby Mara spends her time crawling, clapping, and climbing all over the place. This field season would not be possible without early-season help from Mara's grandmother, followed by the final chunk of Mara's dad's parental leave. Every transect, every garden, every new leaf or flower, and every observation recorded this season is backed by the love & support of a whole family. Despite a mild winter, in many ways it's been a normal-to-slow spring in Acadia. For example, low bush blueberry leafed out on the Cadillac Mountain transect during the second week of May, just as it did in 2014 and 2015, and slightly later than in 2013. Rhodora first bloomed on the Sargent Mountain transect during the fourth week of May, just as it did in 2013, 2014, and 2015. Last week, the whole Primack lab was in Acadia! 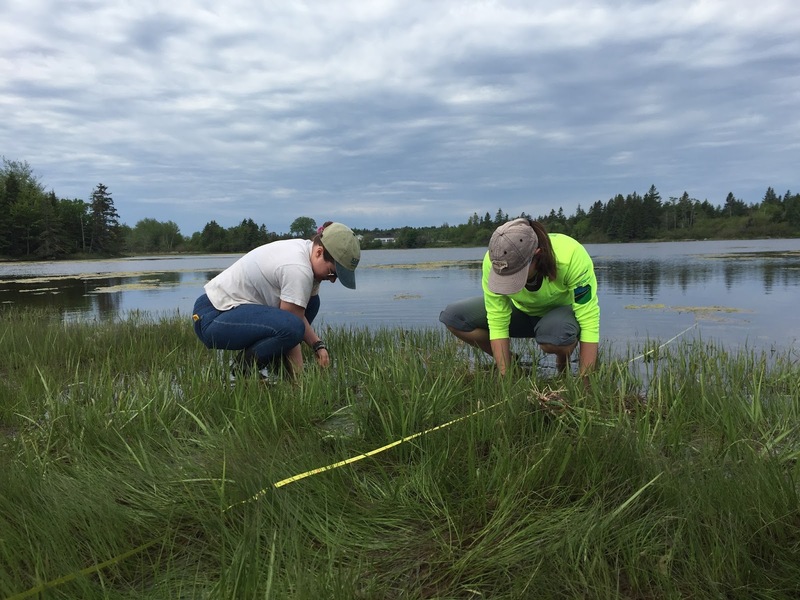 After looking at the Cadillac Mountain transplant gardens, we helped Lucy Zipf establish reciprocal transplants in salt marshes in Mount Desert Island. 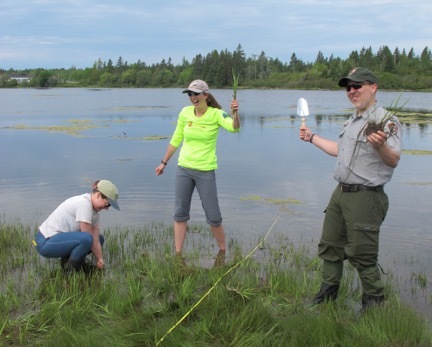 I loved the chance to trade in the ridges for tidal marshes and see a whole new side of my field site with the lab! 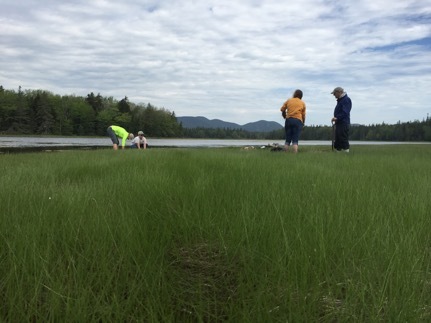 I'm looking forward to spending the final weeks of the field season out on the ridges, in the (non-marshy) gardens, and with my family in Bar Harbor. At the end of the day, nothing beats some cozy old maternity sweatpants, slobbery baby kisses, and the opportunity to share my favorite field sites with my husband. On Thursday, Birches School, an independent elementary school in Lincoln, MA, hosted a visit by Boston University Professor Richard Primack. 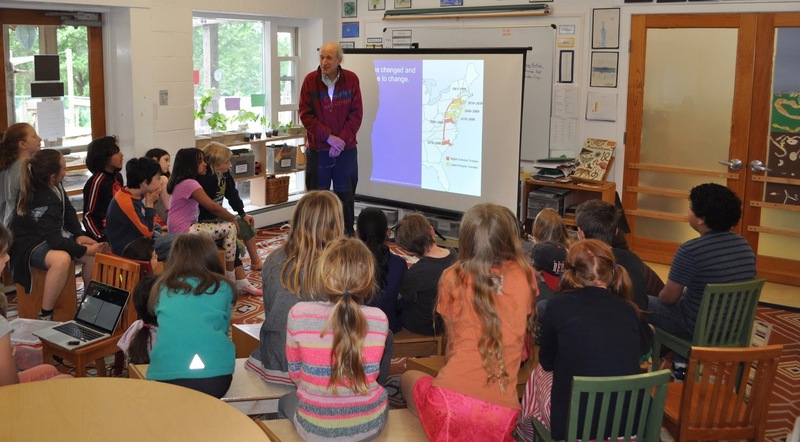 Professor Primack spoke to 2nd-5th graders about how he and his lab members track climate change by comparing the 160 year old notebooks of Henry David Thoreau with current observations and climate data. They follow several indicators of spring arrival in nearby Concord: the timing of birds and insects, flowering and leafing out times of plants, and significant changes in temperature. Birches students were especially interested in the projected changes in water levels and temperature shifts that Professor Primack outlined as predicted for the next century. Birches students and teachers also shared with Professor Primack the details of the People for Pollinators meadow project. We are working with the Lincoln Land Conservation Trust on a citizen scientist field study, cultivating a quarter acre of land with plants selected to feed and provide healthy habitat for local pollinators. Two plots have been designed at the meadow site: one is fertilized and the other is not. The hypothesis is plants that are grown in nutrient rich soil are overall healthier and will attract more pollinators compared to plants that have been grown in untreated soil. Our students and the community at large will record meadow observations HERE. We also showed Professor Primack our indoor plant lab and described our micronutrient study of the effects of adding boric acid and manganese on buckwheat plants. We enjoyed sharing our class projects with Professor Primack. 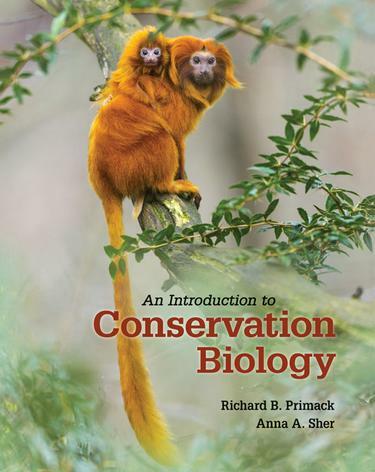 Last month our new textbook appeared, entitled An Introduction to Conservation Biology. The book was co-authored with Anna Sher of the University of Denver, and updated to 2016. At 450 pages, the book is intermediate in length and coverage between the shorter Primer and the longer Essentials. Our goal is to produce a longer and more advanced graduate-level textbook in the next two years. You can find the first 80 pages of the Introduction HERE. Webster Woods is the largest open space in Newton, occupying most of the land between Chestnut Hill and Newton Center, and part of it is now under threat from development by Boston College. 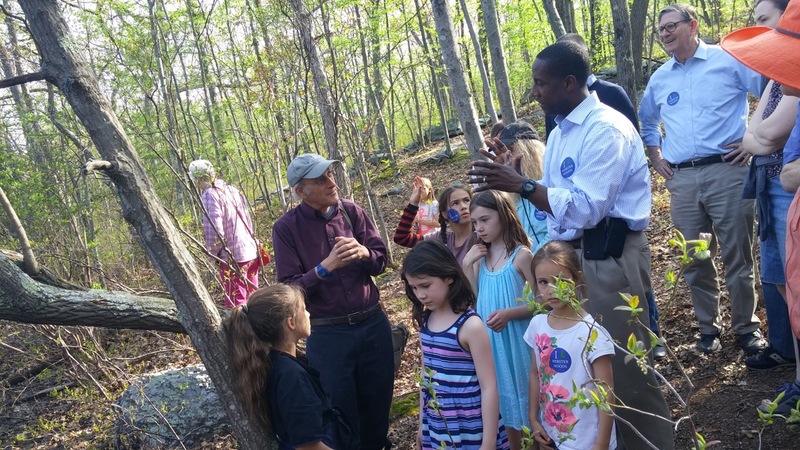 Recently I have highlighted the educational and scientific value of Webster Woods in an article in the Newton Tab and in public walks, one of which included Newton’s mayor Setti Warren. Webster Woods represents an important regional educational resource that is readily accessible by public transportation. Each year, hundreds of students from Boston College and Boston University come here to learn basic ecological principles and bird- and plant-identification skills. Conservation students around the world read about Webster Woods, which I use to illustrate key principles in my conservation textbooks, such as how habit fragmentation by roads affects animal populations. Webster Woods has also inspired and hosted scientific research. For example, during the 1980s we investigated pink lady’s slipper orchids, a favorite flower of many New Englanders, to determine if there is a cost to reproduction. In the 1990s we tested methods to restore native wildflower populations, involving hundreds of volunteers, including children and teachers, planting wildflowers. The project was covered in The New York Times and continues to inform plant restoration ecology. My students and I have recently been investigating how global climate change is affecting trees and shrubs in these woods. In the coming decades, I hope we will continue to protect Webster Woods as a place to do science and to encourage budding biologists and scientists, and as a place to simply walk and enjoy nature. I think the next generation deserves that same privilege— we owe it to them.